My kids have a new favorite book. 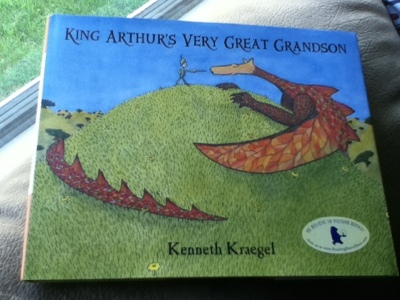 It’s called “King Arthur’s Very Great Grandson” by Kenneth Kraegel (buy it HERE for $9.75!!! What a deal! Usually when they get a new favorite book, I get tired of that book quickly. However, this book is one that I gladly read several times a day. It is funny. Exciting. Heart warming. And the illustrations (also by the author) are gorgeous. With nothing I have to censor. No marketing of toys or candy. No dumbed down language (my kids have learned some big words from this book). Just good, clean story telling. With a message that touches my heart. I highly recommend this book. Nobody paid me. I didn’t get a free book. I just love this book. My kids have a new favorite book.